MIAMI SOCIALHOLIC » Blog Archive » Don’t Miss: Art Wynwood, YachtAid Global, Mardi RA, SUSHISAMBA dromo, Hogzilla’s Fat Tuesday and a Big Bang! Don’t Miss: Art Wynwood, YachtAid Global, Mardi RA, SUSHISAMBA dromo, Hogzilla’s Fat Tuesday and a Big Bang! 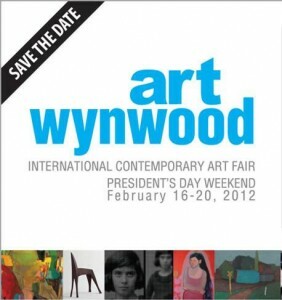 Art Wynwood takes place this President’s Day Weekend, from February 16 through February 20. Held in the spacious 100,000-square-foot Art Miami Pavilion the inaugural five-day International Contemporary Art Fair will showcase a compelling array of cutting-edge, contemporary and modern artwork by both emerging and established artists from more than 50 galleries, including “the flying murals of Wynwood” commissioned by the district’s own Tony Goldman. Art Wynwood will feature paintings, photography, sculpture, art video and new media, conceptual art and urban street art by 500 artists from 13 countries: Argentina, Austria, Canada, China, France, Germany, Ireland, Mexico, Spain, the Netherlands, Venezuela, United Kingdom and the United States. With representation from 100 cities from around the world, including 50 across the U.S., Art Wynwood will further distinguish the Wynwood Arts District as a leading cultural destination for acquiring contemporary art. VIP Private Preview will be held throughout the weekend, beginning on this Thursday, February 16, from 6:00 to 10:00 p.m. For more information and a full schedule of events visit www.art-wynwood.com. 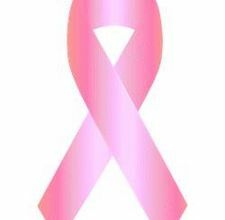 The Pink Army needs you! Join the Pink Warriors this weekend to help spread the word on early breast cancer detection. Help these courageous women on a mission to reach their goal, “Our 2012 goal is to photograph 3,000 women in 30 cities in Mexico and the United States and reach a total of 5,000 women who make up what we call The Pink Army (PINK WARRIORS) who are commitment to spreading the message of awareness for early detection of breast cancer”. The Photo Shoots are scheduled for Friday, February 17 from 1:00 to 4:00 p.m., Saturday, February 18, 10:00 a.m. to 1:00 p.m. and from 3:00 p.m. to 5:00 p.m., and Sunday, February 19 from 10:00 a.m. to 1:00 p.m. 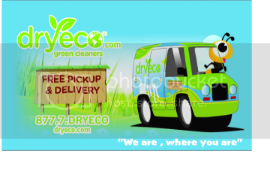 The Photo Shoot will take place at Baby Sensory 1800 S.W. 1st Avenue, Suite 307.All shots will be taken from the chest up and participants will be lightly painted. If you would like more information, contact me Jennifer Heegaard at Jennifer@jejeconsulting.com or Sandra Duque at sandyduquqe@hotmail.com. Walk for the Animals, presented by Pet Supermarket, is scheduled for Saturday, February 18, 2012 at Bayfront Park and is an exciting and worthwhile activity for the entire family–and, of course–dogs. The Walk is the Humane Society of Greater Miami’s largest annual community event, attracting over 3,000 people. This year’s Grand Marshall is District 4 Miami-Dade County Commissioner, Sally A. Heyman. The Leader of the Pack is Associate Vice President and Controller of University of Miami, Theresa L. Ashman, and for the fourth year, the event’s emcee is WTVJ – NBC-6 meteorologist, Ryan Phillips. There will be fun-filled activities for the entire family, including all furry friends. Sponsors will be offering music, games, prizes, product samples, and great food. There will be a special Bakery Tent filled with mouth-watering pastries to be enjoyed with a fabulous cup of Coffee Brake coffee. Registration opens at 8:30 a.m. and entertainment will be provided from 9:00 a.m. ‘til noon. The one-mile stroll around the park (with or without a dog) begins at 10 a.m. The minimum donation for an individual walker is $50 and includes a Walk t-shirt, a fabulous goodie bag and doggie bandana. Or, form a Pack (team) with your family and friends and receive personalized Pack goodies! Big Dog Packs are for walkers 18 years of age and over and Proud Pup Packs for those under 18. The Pack raising the most money will be recognized at the event with a special surprise. For more Walk information, visit www.humanesocietymiami.org, or to register, go to www.firstgiving.com/hsgm. Join the Miami Science Museum for the Annual Galaxy Gala & Big Bang Saturday, February 18 at the JW Marriott Marquis Miami & Hotel Beaux Arts. This year’s 10th Annual Galaxy Gala will feature a cocktail reception and silent auction followed by a seated dinner, extraterrestrial-themed décor, live music, dancing and a laser entertainment experience, immediately followed by the Big Bang, a high-energy dance party designed for the young and influential professionals of Miami. The Galaxy Gala and Big Bang will shine the spotlight on the 60+ year mission of the Miami Science Museum and kickoff a week-long schedule of groundbreaking festivities for the new $275 million Museum waterfront project, the Patricia and Phillip Frost Museum of Science in downtown Miami. Ticketing information is as follows, Galaxy Gala: Ruth Robinson (305) 646-4249 rrobinson@miamisci.org; Big Bang: Tony Lima (305) 646-4209 tlima@miamisci.org; Event & Tickets Website: http://www.miamisci.org/www/gala_intro.php. Nikki Beach Miami announces “What Women Want”, their signature fashion series; this year Nikki Beach Miami presents Furla and I, the spring 2012 handbag and accessory line on Saturday, February 18, from 7:00 to 10:00 p.m., with a stunning fashion show to enjoy. Guests are encouraged to join Nikki Beach Miami for dinner before the show, at the beachfront restaurant. The Furla collection for spring-summer 2012 is a rich travel diary filled with visual and tactile notes on the Mediterranean and Italian tradition. What Women want and Nikki Beach proudly support the American Heart Association and their Go Red For Women campaign, promoting heart health awareness. Furla has graciously donated one if its stunning red handbags to a gift basket which will also have several other wonderful items and will be raffled off to one lucky winner. Nikki Beach will donate all raffle proceeds to the American Heart Association All guests joining us for dinner will enjoy a complimentary welcome glass of champagne! For more information visit www.nikkibeachmiami.com. RA Sushi in South Miami brings Mardi Gras to you on Tuesday, February 21 from 7:00 p.m. to close celebrating its version of Fat Tuesday with “Mardi RA.” During the event, enjoy food and drink specials, festive décor and entertainment. Get in the spirit by dressing in Mardi Gras attire and throwing on some colorful beads. A special guest D.J. will keep the crowd going all night long. Take a bite out of the Big Easy with a variety of spicy food specials made just for the occasion. Stop in to RA Sushi in South Miami and enjoy one of these Southern spirits with a special twist, or mix one up at home for your own celebration. 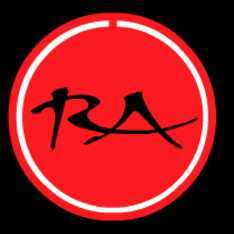 www.rasushi.com. 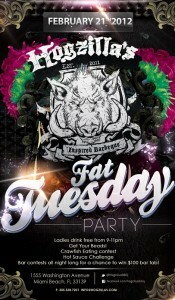 On February 21, Hogzilla’s Inspired Barbeque celebrates Fat Tuesday encouraging partygoers to have as much fun as humanly possible before the need to feel bad about it and repent the following day. In true Mardi Gras spirit, Hogzilla’s will be partaking in excessive indulgences with crawfish eating contests, hot sauce challenges and a chance to win a $100 bar tab. Ladies are welcome to drink free from 9:00 to 11:00 p.m. Oh yes, beads are included! Join SUSHISAMBA dromo for the annual Carnaval celebration that will exhilarate all your senses. On Tuesday, February 21, beginning at 9:00 p.m., SUSHISAMBA will host a special Carnaval festivity to mark Rio de Janeiro’s most extravagant celebration. In addition to the delectable menu specials, revelers will enjoy live performances by shimmering samba dancers dressed in elaborate garb, the beats of booming batucada drummers, dj’s and more. In addition to the regular menu, guests can cheer on the night with a tasty Carnaval Cocktail $12 (leblon, domaine de canton, fresh kiwi and champagne) and the following Carnaval specials:The Carnaval menu includes King Crab Palmito Salad of heart of palm, papaya, passionfruit vinaigrette and candied cashew ($20); Copacabana Crispy Red Snapper with lime, chili, cilantro and coconut rice ($35); Carnaval Roll of tuna, salmon, shrimp, yellow chimichurri and Brazil nut ($15); and Banana Split of doce de leite ice cream, coconut mochi and yamazaki cream ($14). SUSHISAMBA dromo will broadcast a live feed of the celebration in Rio de Janeiro, bringing the energy and excitement of the world’s largest party straight to the heart of South Beach. 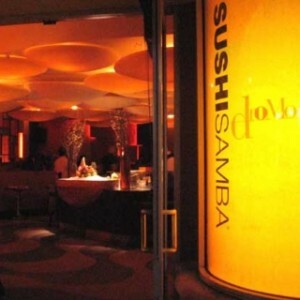 For more information on the Brazilian celebration, visit www.sushisamba.com. 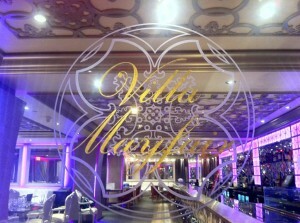 On Wednesdays the fabulous Villa Mayfair will be hosting their very new “Blush Wednesdays” which is a decadent Wednesday of free Rose + Rose champagne for ladies all evening in addition to a $35 prix fixe menu prepared by Michelin star Chef Frederic Joulin for all the ladies. The vibe is fantastic, the food is outrageously good and with cocktail stars like John Lermayer, voted #1 bartender in Miami, and Nick Nistico, multiple award winning mixologist, behind the bar and the in house dj spinning it is the recipe for the perfect Wednesday night both sexes. To RSVP go to VillaMayfair@OceanDrive.com. Good day, I’m really impressed with your writing skills as well as with the layout on your weblog. Is this a paid theme or did you modify it yourself? Either way keep up the nice quality writing, it’s rare to see a great website like this one these days.. Btw, if you would like to make bucks from every single clicks you receive to the links in your blog posts, AdTrim is an ads network that offers you to shorten links so that when anyone clicks on the links, they will be shown an advertisement and you will earn $44 per 10k visitors. At this time the site is paying on time. I made over $1500 With AdTr.im within a month’s time. They do not ask for you to upgrade or purchase anything. Earning money is easy for each visitor to your blog with this url shortener. Bless you.